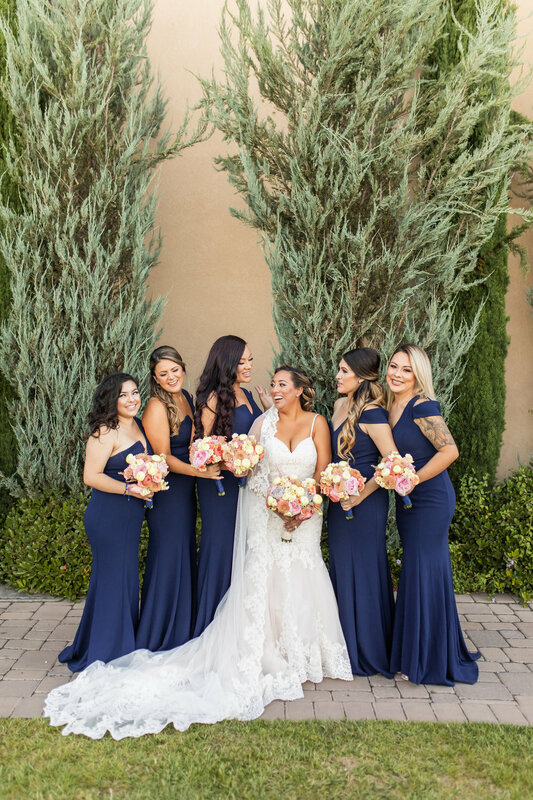 Murrieta’s Well in Livermore, California, is the perfect rustic venue that you are dreaming of for your wedding! On top of the welcome sign, we placed an arrangement of eucalyptus, roses, and jasmine. Our bride’s bouquet was a beautiful and unique pairing of café au lait dahlias, amnesia roses, and grey/purple succulents with lots of silver dollar greenery. The bridesmaids had small bouquets of 6 blush roses and lots of silver dollar. 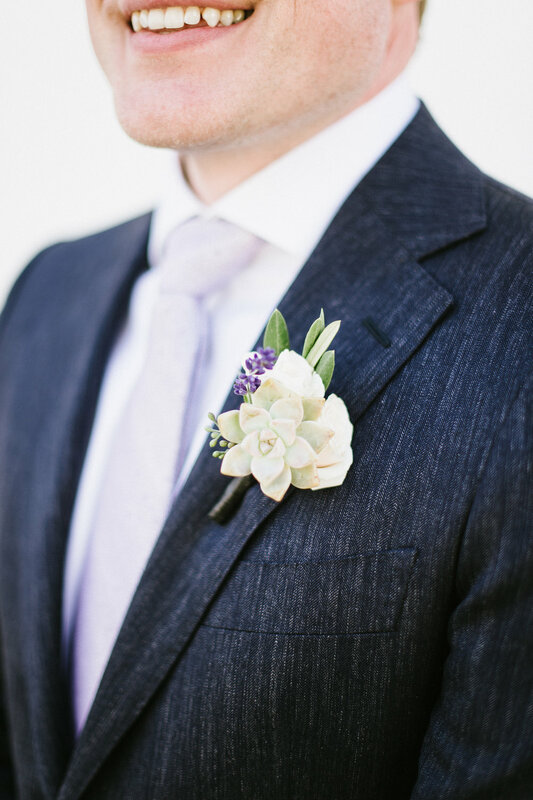 The groom’s boutonniere was made using a petite purple succulent, blush tea rose, with hints of ruscus. The ceremony aisle was doused in white and blush rose petals. 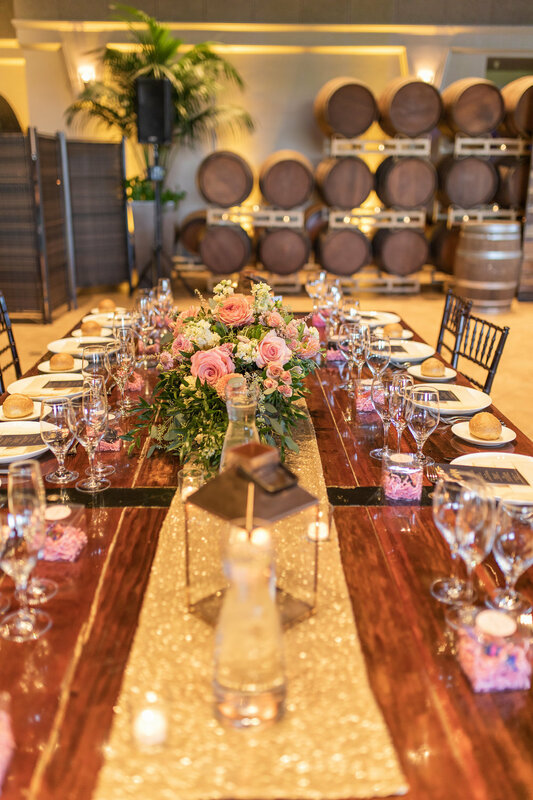 We placed two centerpieces from the reception on top of barrels at the beginning of the aisle. The low lush centerpieces for the reception were arranged loosly using amnesia roses, ranuculas, lisi, and lots of greenery. At the sweetheart table, we placed a silver dollar garland with tucked in white and blush roses. Lastly, we topped the cake off with blush roses. 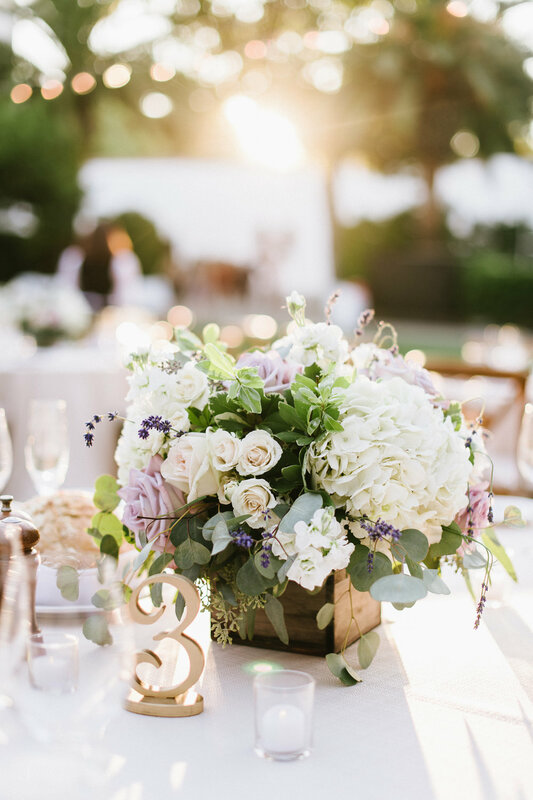 A romantic lavender affair at Wente Vineyards in Livermore, California. This beautiful couple chose to hold their wedding at Wente’s terrace lawn, which provides an open outdoor canvas, perfect to custom design your dream wedding! Our bride envisioned a tender and romantic wedding, with hints of rustic elegance. To start, we topped the rustic welcome sign with a 3 food garland with white and lavender blooms tucked in. For the bridal bouquet, we arranged a textured pairing of blush garden roses, true lavender and off white roses, with hints of English lavender. The bridesmaid bouquets were smaller version of bride’s, but with no lavender roses and added in lavender sprigs. The groom’s boutonierre was made using off white tea rose, succulent, and lavender sprig. The aisle of the ceremony was doused in delicate white rose petals. For the altar, we placed a 16 foot eucalyptus garland with white and lavender roses tucked in. We repurposed some of the centerpieces for the reception as barrel arrangements to brighten up the ceremony. 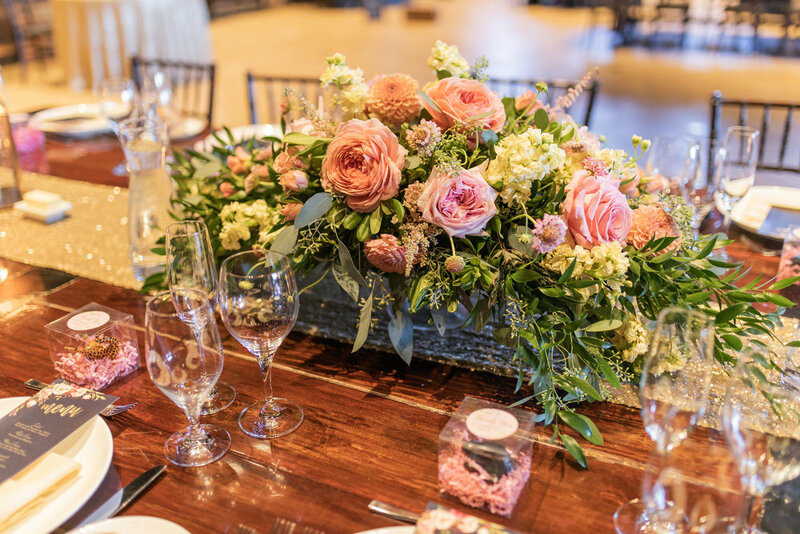 These centerpieces were arranged in a rustic wood box, using creme roses and hydrangeas, adding in lavendar sprigs with lots of greenery. The sweetheart table was decorated using the same garland used for the altar, as well as some added in candles for a touch of romance. Lastly, we topped the wedding cake with dainty roses and succulents. A perfect blend of romance, individuality, and picturesque beauty. 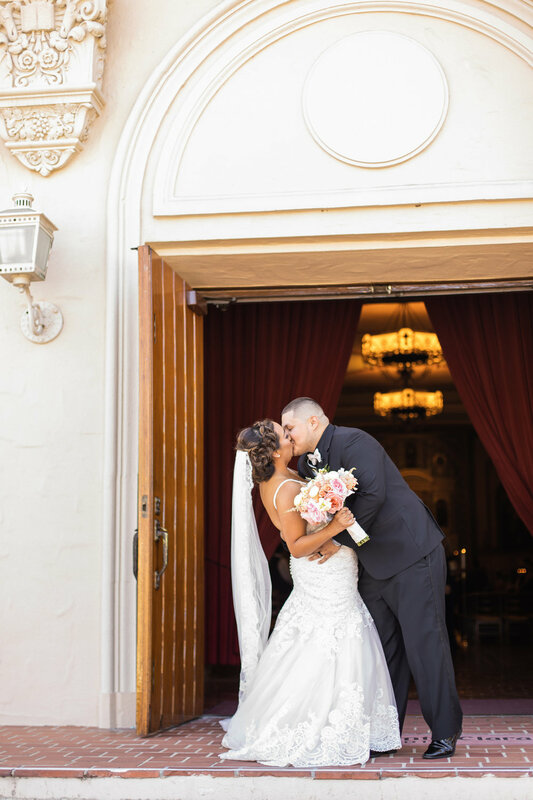 This colorful wedding was held at The Palm Event Center located in Pleasanton, California. Our bride envisioned a vibrant and unique wedding with pops of the couple’s personality. For the bridal bouquet, we created a textured arrangement of yellow stock, grey succluents, coral dahlias, and yellow ranunculas. The bridesmaid bouquets were a smaller version of the bride’s bouquet, but without the succulents. We had two large barrel arrangements at the entrance of the reception . At the sweetheart table, we had two cocktail arrangements as well as flower arrangements tucked into the LOVE sign behind the couple’s table. There was also a variety of different centerpieces throughout the reception. 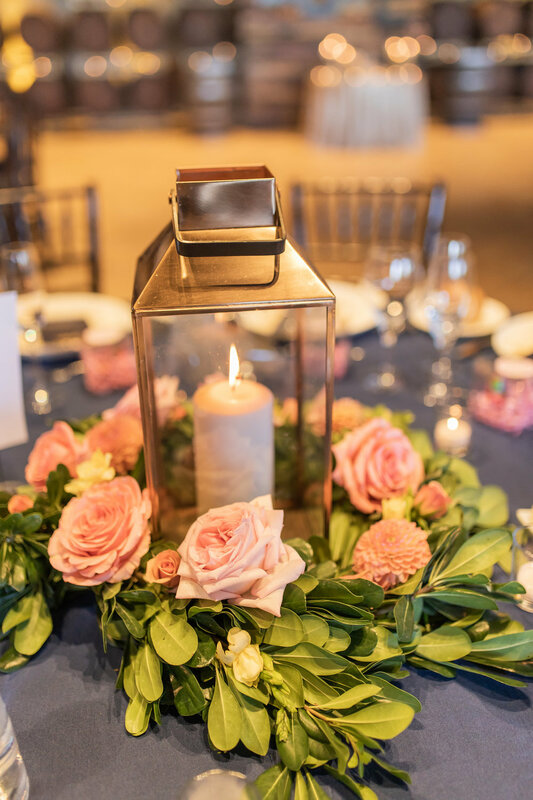 Some of the centerpieces were candle lit lanterns in the middle of a pink rose garland which provided a beautiful romantic essence. The other centerpieces were low lush arrangements that sat in a glass footed dish, filled with the same flowers used in the bridesmaid bouquets. The cake was topped with succulents and petite pink blooms.